Two kids are making out in a car when the girl hears a noise. It's his dad, the sheriff. The girl goes to the bathroom while the two guys talk. A monster comes in the bathroom and the sheriff investigates after she screams. She's missing and he runs into the woods to investigate. The boy finds the girl dead. 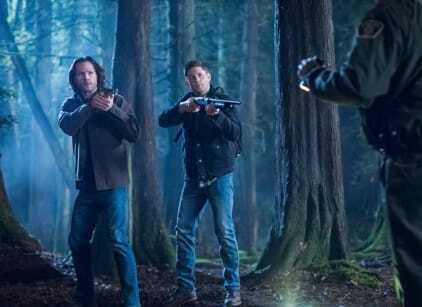 Sam tells Dean about the case and they decide to investigate but without Jack. Dean gives Jack a mission before they leave...shopping. Sam and Dean arrive in the small town to investigate the girl's death and look at the body. Jack goes shopping but the store is closed. Some kids come up to Jack and realize he knows Sam and Dean. They're the kids who are obsessed with the ghost hunters. Jack finally gets into the store. The other kids invite him out the next out. Sam founds information about a Native American monster, Gota. Another couple of kids are in the woods when weird singing starts and the monster appears. He attacks the boy. Sam and Dean go to investigate but the sheriff prevents it. Jack arrives at his friend's house and it's weird. He shows off some of his Jedi skills. Meanwhile, Sam and Dean go to the woods but the sheriff isn't happy. Jack accidentally stabs one of the girls with the angel knife while he's playing around. Jack heals her. The kids leave and they don't like Jack anymore. The sheriff tells the story of the monster. The son goes looking and the monser attacks him but the sheriff arrives in time. They fight the monster stabbing it and then it melts away. Sam and Dean head back home. Jack doesn't tell them whatt happened.